Only fill in the following fields if you chose the customized M&B in the forms section above. Customized Minutes & Bylaws or Co. Agreement Info. 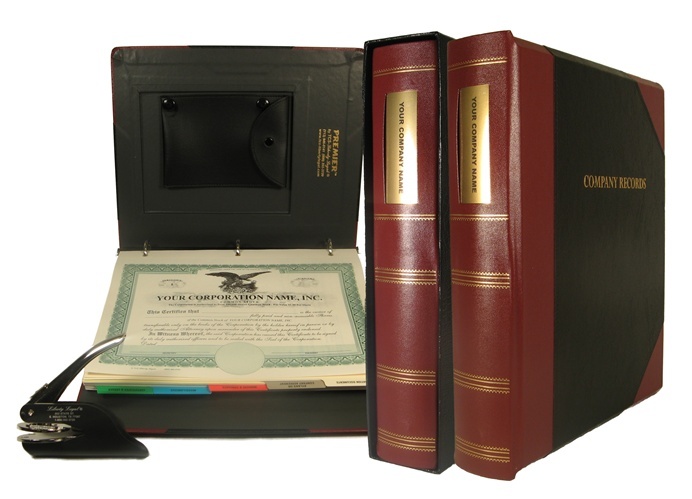 Premier Minute Book with engraved spine nameplate and matching slip case. 20 custom-printed full size Certificates, numbered with full size page stubs all permanently bound. Your Choice of: 1. 50 blank sheets of archive quality 25% cotton rag minute book paper or 2. Printed Minutes & Bylaws/Company Agreement which you fill in or 3. Customized Minutes & Bylaws/Agreement in which we fill in your Company name and organizational meeting minutes for you. F.I.N application and S Election are included. Texas Corporation Supplies - Liberty Legal your reliable source for corporate kits, stock certificates & company seals for 40 years! We can now Incorporate, form an LLC or other business entity in Texas!